Here is our gallery of all the fantastic blank brain images we’ve been sent so far – click on one to see a bigger version, or scroll down to see each of our blank brain entries and a little bit of blurb from me with my initial thoughts on these images. 11.05.2012 – Our first blank brain entries!!! I was very excited to open my post yesterday, not only because I had a lot of expressions of interest from pharmacists saying they would like to take part in my study, but also because I had two blank brain entries. My First two!! 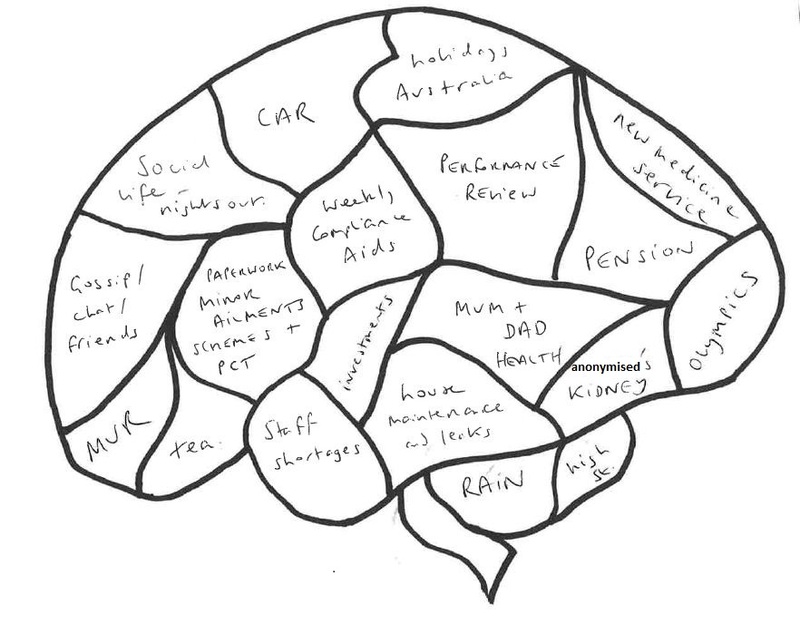 This entrant says this is what their brain looks like when they are at home , work and elsewhere (so I guess it is what it looks like all the time). This entrant is a pharmacy manager and they work in a pharmacy that is part of a large chain of pharmacies in the UK. NMS = The New Medicine Service, this is a new service that community pharmacies started providing at the end of 2011. The new medicine service focuses on patients with long-term conditions that have been prescribed new medicines. It is an advanced pharmacy service provided by many community pharmacists and the aim is to help patients with a new medicine to make sure they know how to use it, when to take it etc and to deal with any problems or side effects they may be experiencing. More information about NMS can be found here on the Royal Pharmaceutical Society website. There is also a video of a pharmacist and GP talking about this new service here. MUR = Medicines Use Reviews, this is another advanced service that many (but not all) community pharmacies offer. Like the aim of the New Medicine Service, it aims to help make sure people are taking their medicines as safely and effectively as possible. Sometimes people are taking more medicines than they need to or they are experiencing side effects that could easily be alleviated. Often, when we have been taking medicines for a while, and if we are taking more than one medicine, we are not sure what they all do, and the pharmacist will be able to explain and help with all that. This service is aimed at people with chronic long-term conditions that they take medicine for (e.g. asthma, diabetes etc) and for people who have lots of different medicines to take. More information about the MUR pharmacy service can be found from this leaflet from the department of health. Here is entry No. 2. 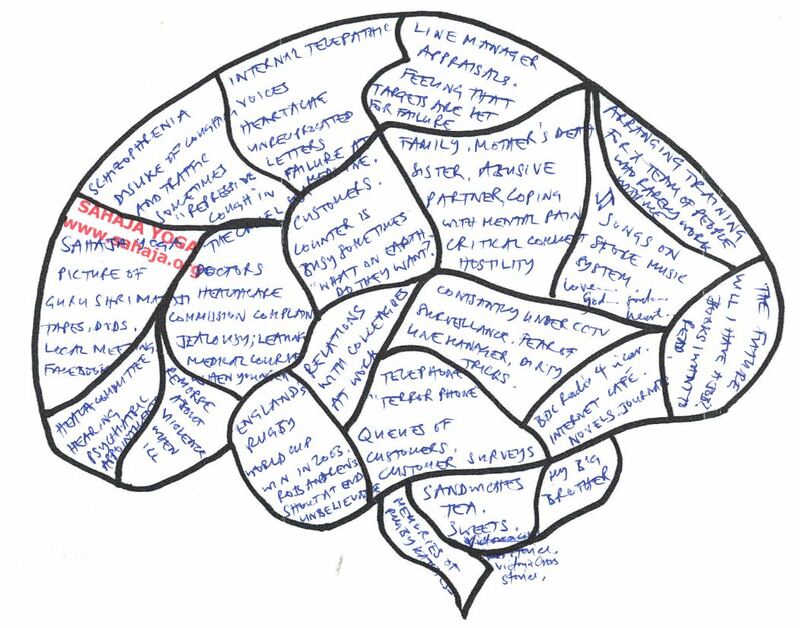 This entrant says this is their brain when they are at work. This entrant is also a pharmacy manager and they work for a pharmacy based in a supermarket (so part of a chain of pharmacies too). There is one more abbreviation to explain in this blank brain – CPPE training. CPPE is the Centre for Pharmacy Postgraduate Education and they provide a large bulk of the continuing professional development training for pharmacists. I also thought I would explain what a dosette box (see image here) was in case people aren’t familiar with them. These are great for people taking lots of different medicines all at different times of the day or week – the pharmacy will prepare one of these for you where all the medicines you need to take – say on a Sunday Morning are put into the Sunday Morning blister pouch. This is done for the whole week and then sealed ready for you to take your medicines each day. Two fabulous blank brain entries and certainly a lot can be learned about the pressures pharmacists experience from these images. However – in entry two we can also see a lot about the releases – the things some pharmacists look forward to doing when they are not at work. Fingers crossed we get lots more entries as they are great – and make me jump up and down in the office (much to the bemusement of my colleagues). 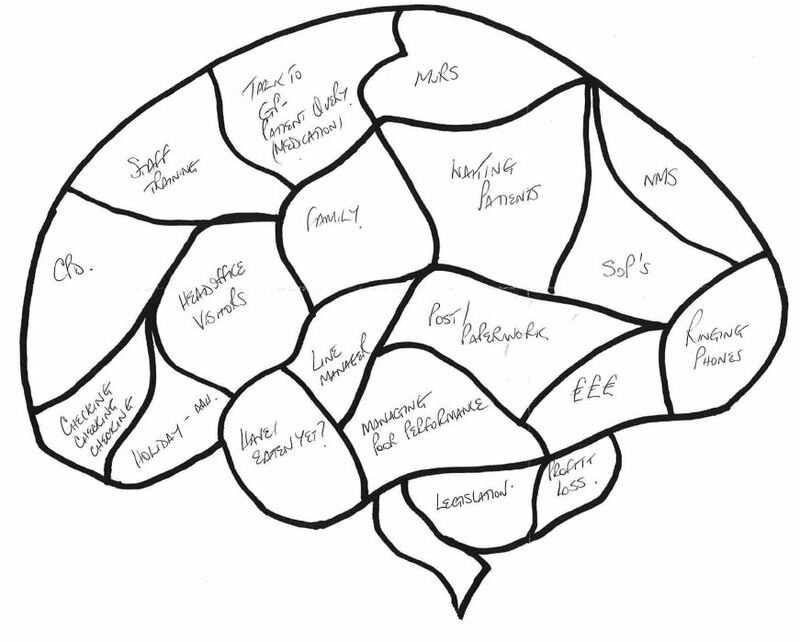 16.05.2012 – Some more blank brain entries! 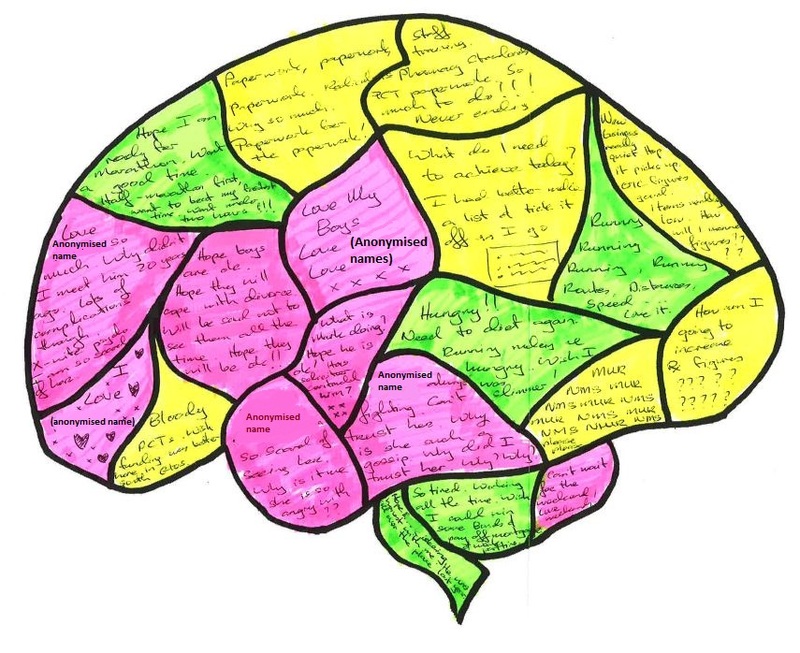 I am so excited, thank you to all of you who are sending in blank brains, they are lovely to read, and are going to make so much difference to this project as we collect data because each one gives me another idea or insight into this thing I am studying called mental workload. There are more to put up, I am just still in the process of scanning them and compressing them for this page. Thank you! This is the brain of another pharmacist, their role is pharmacy manager at a supermarket pharmacy. 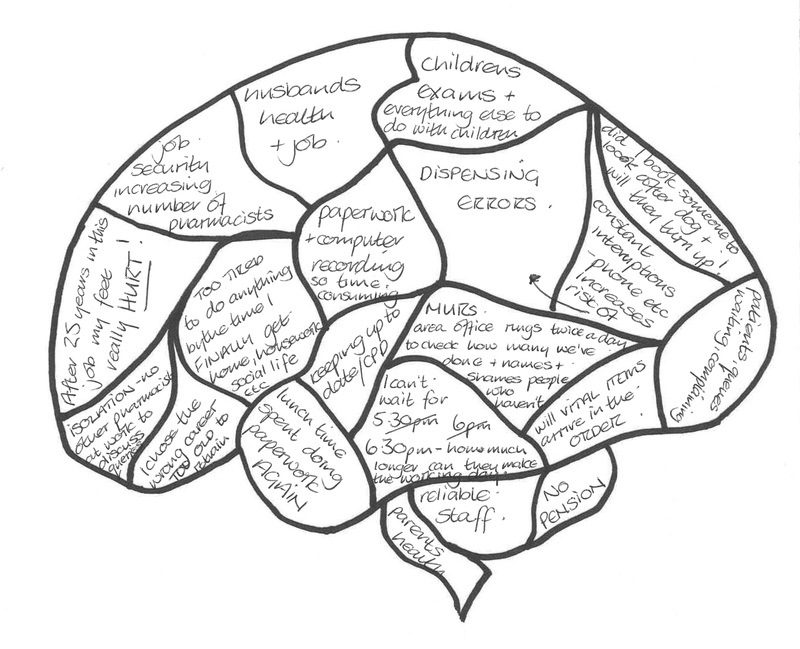 This is what their brain looks like when they are at home – as you can see there are still lots of thoughts about their pharmacy when they are at home. Does anyone manage not to take their work home with them? I certainly haven’t, it would be good if I could figure it out though before I finish my PhD and go back to the real world! I also love that this pharmacist has ice cream on their brain – I love ice cream and cake! One or the other is definitely on my brain throughout the day, usually figuring out how far I can run (or not run….usually the smallest distance possible) on an evening so that I can eat cake/ice cream after my dinner! 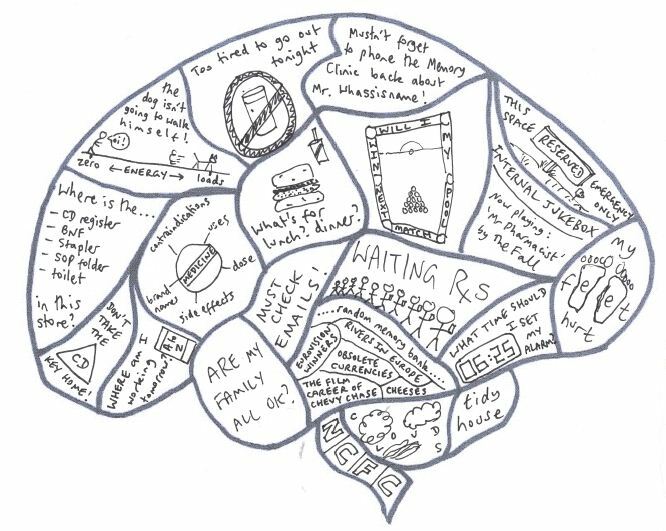 28.05.2012 – Another blank brain entry! Well I have been so busy helping with our departments exam timetable (doing a few invigilation sessions) and running the study that I have neglected to update this page with a blank brain entry I received last week. It is another fantastic entry and it made my day when I received it – so a big thank you to the pharmacist who sent this one in. This brain is from a pharmacy manager who works for a large pharmacy chain in the UK. 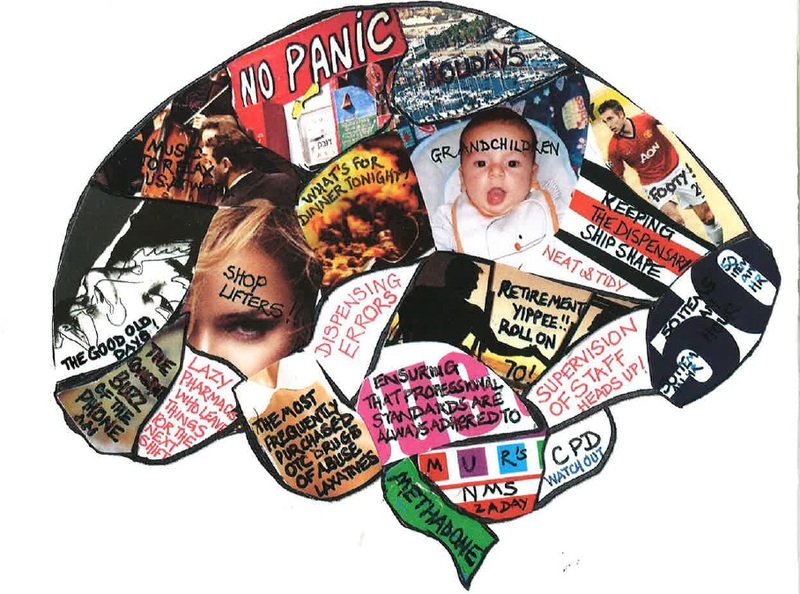 They tell me that this is their brain when they are at work and as you can see there are lots of pressures on this person’s brain relating to targets. The NMS and the MURs targets you will recognise from the earlier brains (see below – where I also explain what the abbreviations NMS and MUR stand for). One abbreviation that even I hadn’t come across before, is PGD which I think stands for Patient Group Directions (I hope I am right – apologies if I’m not). I need to be quite careful in the way I word my description, because this term really stands for a legal document, rather than a defined service like the MURs (medicines use reviews). Many pharmacists may have in place a set of PGDs for different groups of patients /or different products. 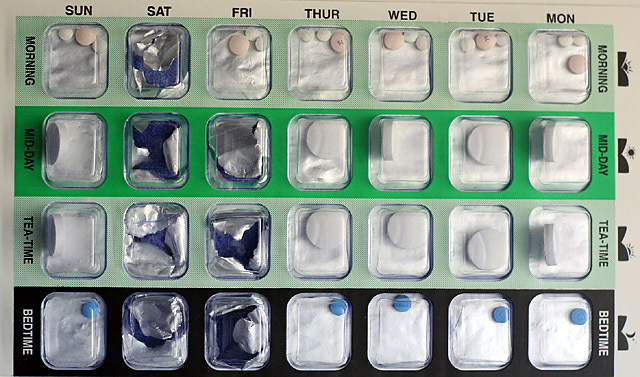 A PGD allows pharmacists (this is not limited to pharmacists – other healthcare professionals can organise to have these in place) to supply a specific prescription only medicine to a patient who matches a set of strict criteria in specific circumstances (these criteria and circumstances are very specifically outlined in the PGDs). The point of the PGDs is to allow individuals access to certain products which they may not access otherwise (i.e. because they may not feel the need to go to their doctor about it – but may find themselves in a pharmacy for another reason) and to encourage self-care. So for example, a specific product to help someone who smokes to stop or reduce their smoking. This is limited to certain products where advice and care can be given by the healthcare professionals using these PGDs and where safety would not be at risk for the medicine to be supplied in this way. So I have unexpectedly learnt something new today. Things I loved about this particular brain were: (1) the illustrations – especially the little details like the rain cloud above “holiday in August” clearly a worry that weather might not be as nice as one would hope in August (not surprising as I then noticed this is a holiday in the UK)! (2) there are clearly more things on this pharmacist’s brain than I allowed spaces for (you can see there are parts where they have divided the brain up even more to fit in all these extra thoughts). Every time I look at this one – I notice something else it is so detailed – thank you! I have my fingers crossed for lots more entries before the end of the year! 21.06.2012 – Another blank brain entry! Every day that I get another entry through the post I am very excited and this time was no exception when I opened this entry in the reception in the Pharmacy and Pharmacology department at the University of Bath. However, upon opening it, in my usual excitable manner I exclaimed “yes I’ve had a brain through the post.” Well you can guess the kinds of comments that received, oh so many jokes about my lack of a brain! I did not care though as I had another blank brain entry and I dashed off to scan it and upload it to my computer! So here it is entry number 5. This entrant is a Relief Pharmacist for a large pharmacy chain, they also do locum work for other pharmacies as and when they are not providing relief cover for this pharmacy chain. Several aspects of this brain interested me as it brought up some new themes. Firstly the isolation factor, I am sure this must be something that a lot of pharmacists face as many pharmacies (from what I am now learning as I get on with my recruitment) run with only one pharmacist present each day. There are bound to be times in a healthcare professional’s working week when they are faced with a complex case which they would find helpful discussing with a colleague before they decided on a plan of action. A colleague may even have the benefit of experience with a similar case in the past. In recent months it has been well publicised that pharmacies and other healthcare facilities are struggling to get hold of some vital medicines and which is clearly on the mind of this pharmacist (see a BBC news article about this here). What all these brains demonstrate is that every pharmacist carries around professional and personal pressures on a regular (dare I say daily) basis. All of these pressures take up brain space – as our brain is busy mulling over, worrying or being irritated by these pressures, leaving less space to process information relating to tasks we are carrying out like dispensing. Yesterday was a great day I received two more blank brain entries – here are entries number 6 and 7. This entry is from a pharmacist who works in an independent pharmacy (for those of you who aren’t part of the pharmacy world this is a pharmacy that doesn’t belong to any of the big pharmacy chains. It also may be a pharmacy attached to a GP surgery – this is a guess based on one of the segments which says I wonder if the doctors next door will strike! If their pharmacy is attached to the GP surgery and the doctors do strike I wonder if this will affect their pharmacy business? You will also notice on this brain lots of similar segments on the MUR and NMS services – these services really do seem to take up a lot of pharmacists’ brain space! However, I think this pharmacist might have some space or different things on their mind now, given that we now know that England did not beat Italy! I wonder what thoughts could have filled in that gap. Maybe thoughts over England’s struggles to win on penalties (even though they had been practising penalties)? That is as far as my football knowledge extends so I am going to stop writing about it now!! I am not sure how well I managed to scan this image – it was readable when I scanned it as a PDF but in transfer to a JPEG image it seems to have lost it’s readability – have a look at the original PDF if you are struggling to read this image. Another fantastic entry, this one is from a locum pharmacist. I have noticed some themes in this image which I guess relate to many locum pharmacists – for example – the segment that says ” where is the CD register, BNF, stapler, SOP folder, toilet in this store? Locum pharmacists may work in a new pharmacy everyday and so they may have to familiarise themselves with all this information when they start each shift. Which is difficult because often they may be the only pharmacist present and the pharmacy will open soon after they arrive. I am sure locum pharmacists have ways of dealing with the unfamiliarity of other staff and the pharmacy after a while. Of course – as this brain shows, it’s not just where things are in the pharmacy – it’s where is the pharmacy too! If you are working at a different pharmacy each day, that must be hard work – figuring out how to get there, where to park if you are driving etc. I have often undertaken site visits to clinics, hospitals and GPs when I have been working on other projects and I would always leave myself an extra 30mins because I would always take a wrong turn at some stage of the route! My drive to uni in the morning is relatively stress-free because it is the same everyday – I have to pay attention to what is happening on the road, but I don’t have to think about the route – which for me is half the effort as I have a terrible sense of directions (the kind of person sat nav was designed for). Having to do a new route everyday would require a lot more effort – and whilst we are on the topic a lot more mental workload which is what I am looking at in my project. Have you ever noticed that if you drive somewhere new how much more effortful it seems than when you drive your normal route to work or back home. That is mental workload – sometimes mental workload can get too high and that is when we take a wrong turn off a roundabout (or more worryingly have an accident), or when we make errors at work. The thing about mental workload is that it can happen for all sorts of reasons – not just because of the task we are carrying out and that is why it is important to study the factors that can cause mental overload (when our brain is trying to do too much at once). To explain the abbreviations above and on the diagram: the “CD register” is the controlled drug register, the “BNF” is the abbreviated title of the British National Formulary which has all the information healthcare professionals need to know about medicines – e.g. the doses, cautions for use etc. The SOP folder is the Standard Operating Procedures folder, which should have a set of SOPs for that pharmacy – many pharmacies have a specified way of carrying out each task, designed to minimise the risk of errors etc). I also really like the funny parts of this brain – like the dog running off with loads of energy compared to the pharmacist who drew this who feels like they have no energy. The segment that says I must remember to ring the memory clinic back about “Mr Wassisname” also made me giggle! I have three more lovely blank brain entries that I have received in the last few days to share with you. Hope you like them as much as I do. Here are entries 8, 9 and 10! Double figures!! This blank brain comes from another pharmacy manager who works for a one of the larger pharmacy chains and they tell me that this is their brain when they are at work. 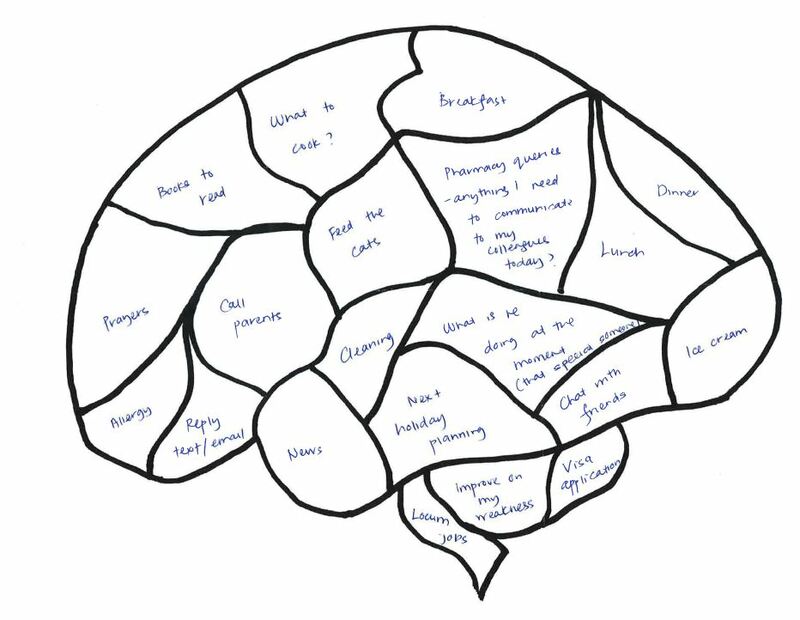 All our community pharmacist brains seem to mention the MUR and NMS services which you will notice at the top of this person’s brain and are described above in more detail. These are clearly services that are becoming a large part of pharmacists work or are on their brains a lot. I was particularly interested in the area of the brain devoted to “managing poor performance” this is not a theme we have come across yet, but I am sure plays a part in most pharmacy managers working life at some point and I am sure it is probably quite stressful, especially when pharmacies tend to be quite busy places. I was also a bit shocked by the “have I eaten yet?” section of the brain, my brain (and stomach) definitely keep me up-to-date on whether I have eaten or not. It may be a consequence of living a less hectic working day compared to pharmacists that I do tend to notice when it is time for lunch. I am not surprised that there are pharmacists who don’t notice lunchtime come and go, as I have observed and spoken to pharmacists about their days and they seem to be non-stop from when they open at 8am till they start winding down at some-point between 5pm and 8pm. This is a great entry and it was sent in by another pharmacy manager of a pharmacy from a national pharmacy chain and they have also said this is their mind when they are at work. The first thing I did when I got this entry was to try to figure out if the colours meant anything. I am not sure if they do (I will have to ask the entrant) but it looks like the yellow sections all relate to work. The pink and green sections seem to relate to this pharmacist’s home life, although this all may well be coincidence and not by design.I think what is most interesting about this blank brain for me is that there are a lot of worries and concerns separate to work itself but that are on the mind of this pharmacist when they are at work. This is not surprising really as it is rare that we can switch off our personal worries or thoughts the moment we get to work and in fact most days if I was honest with myself, often half my brain is dedicated to thinking or worrying about things going on at home or in my life outside work. It is an aspect of being human that we rarely account for when we are at work and our personal worries can add (understandably) to our workload. It’s not just our thoughts about things separate to work, what about all the work we do at home – house work – looking after partners or children. Often our days work and mental work starts a long-time before we get to our job. This is important because this can affect our work for example I refer to one situation in my own life here. Our bathroom was being renovated and I knew it was going to be a stressful week as we were going to be staying elsewhere (much further away from uni) for a few days until the toilet had been plumbed in. I was concerned because it is important as a researcher working with human participants that you keep your emotions in check as much as possible. This is simply because if I am stressed this may affect how the participant feels and this in turn may affect how they behave during the study. So I purposefully didn’t book any pharmacists in to take part that week because I know I tend to outwardly show my emotions and I didn’t want to bias the data collection. There was an easy solution for me, but pharmacists don’t tend to have this luxury as their work is non-stop and can change at a moment’s notice when a patient walks through the door. They can’t really say, today is not a good day for me to talk to you about your medicines! However, there are things we can do to pharmacist’s working environments to avoid any extra mental workload being added by interruptions or other environmental stressors. On a different tangent, like this pharmacist I am training for a half-marathon (although unlike them my full-marathon is not yet planned – just in case I don’t survive the half) and so running at the moment takes up a lot of space in my brain as I am in the last few weeks of preparation before this half-marathon. It will be my first, and I am not entirely sure I can do it. The closer this run comes, the more my brain will be focussed on it and the more I will be having battles with myself as half of me wants to do it tries to shush the other half that really doesn’t! Now that I have written about it on here though, I will have to do it for fear of losing face! Good luck to this pharmacist with their run and thank you for your blank brain entry. 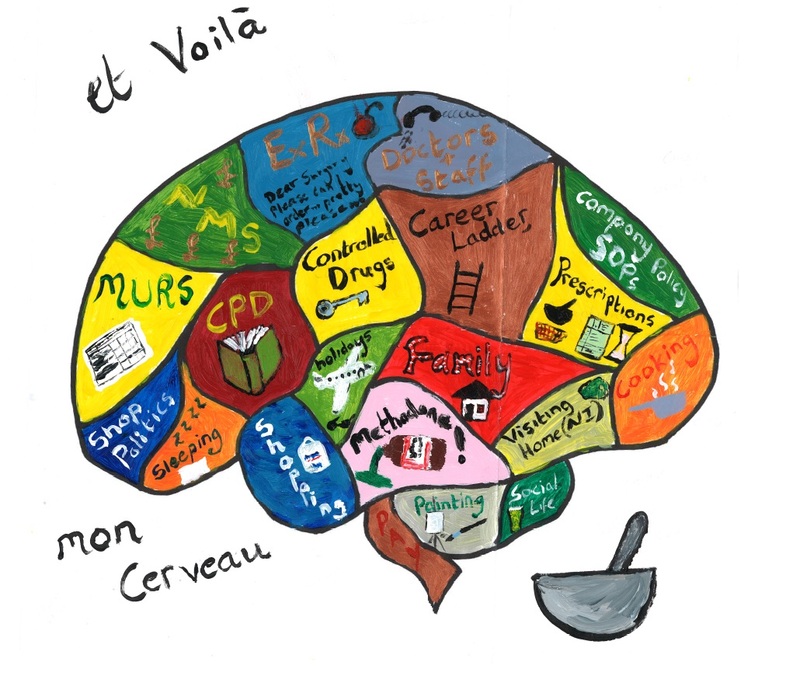 I really liked this brain, because it seems to show a healthy balance between work life and home life (although I don’t know if the pharmacist who completed this feels this way). This entry was from a Pharmacist in Charge for one of the national pharmacy chains. In terms of the pharmacy relevant sections many of the same things are on this pharmacist’s brain as the other’s who have entered. However you may have noticed that both entry 9 and 10 mention PCTs (Primary Care Trusts). As you may or may not know PCTs control a large proportion of the NHS budget at the moment and each PCT in the country may spend this money in different ways so that they can respond to the health needs of their local population. This means that sometimes some services that you can get in one area of the country may not be funded in another. This will include funding of services that community pharmacies provide and so a lot of pharmacists will be involved in some way with the PCT if only to fill out paperwork so that they can be paid for the services/medicines they have provided. So three fantastic entries as you can see – thank you again to the pharmacists who took the time to complete these and enter them. I am hoping we shall get some more entries in the coming week. The deadline for entries is the end of September, so it isn’t that far away now! 27.9.2012 – A new entry! 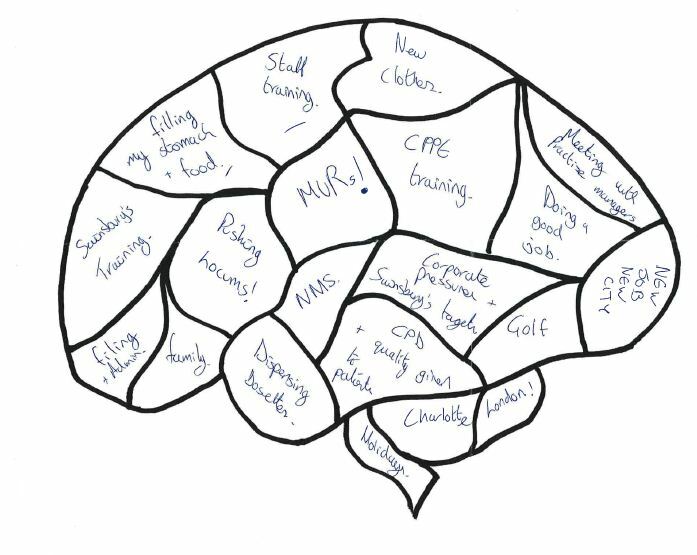 With one day to go until we draw a number out of a hat to find out who has won our community pharmacist blank brain competition we have a new entry and it is a beauty! Check out entry 11 below! This entry has been painted – which is amazing – and there are so many lovely sections in this brain (which I will discuss in a minute). This entry is from a pharmacist working for one of the large pharmacy chains in the UK. They tell me this is their brain both at work and home. One section which hasn’t come up yet, but is certainly something that is on my mind too is the career ladder. Especially when you are “young bean” like me, one can spend a lot of time thinking about where we want to be in five years or ten years – constantly thinking about what you are currently doing and what opportunities there are or what aspects of your current job you would like to build on in the future. I am not sure if this is exactly what this pharmacist is thinking about but it is definitely how that train of thought occurs in my brain! I also thought the term “shop politics” was interesting. Many pharmacies exist within larger stores on the high-street and I am sure that the politics and even the organisational climate in these stores can be very different to what a pharmacist would experience working in a pharmacy that stands on its own, not within a larger business. For me, as a psychologist, this makes the world of community pharmacy very interesting, but also this variation in settings makes it a big challenge to look at aspects of safety because the organisational climate that one works in will have a big impact on how safety issues are tackled. Add to that, the fact that this is just community pharmacy – what about all the other pharmacy professions – hospital pharmacy, primary care pharmacists and there is similar levels of variation within these pharmacy settings too. I could start a whole research career just into the different organisational climates that pharmacists work in (there’s a research idea if no one has tackled it yet!) Thank you so much entrant 11 – I love your blank brain – in fact I love all these entries so much that I have begged permission from my colleagues to stick them up on our office wall! 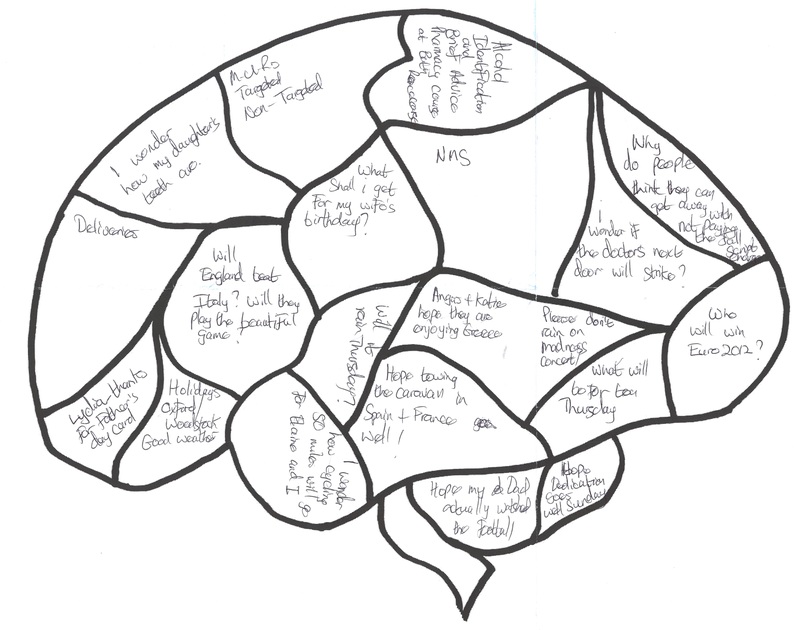 Following our article in the PJ last week we have received a fantastic new blank brain entry, ready for our second round of the competition which will be running until the end of our PTECO funded project (28th February 2013). I cannot tell you how excited I was to receive this entry – and how creative it is! 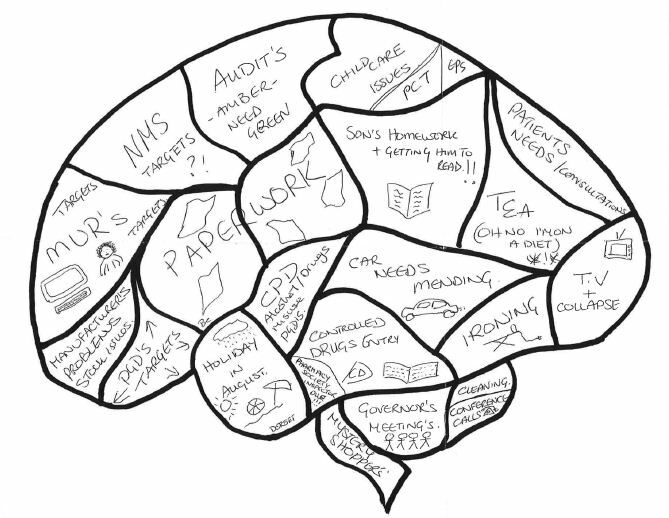 So this has come from a locum pharmacist who works for the large pharmacy chain(s) and they tell me this is their brain when they are at work. The first thing that strikes me about this pharmacist’s brain is how full it is. There is a lot on this pharmacist’s brain whilst they are at work. There are lots of positives – grandchildren, holidays, football, what’s for dinner tonight and retirement in the not too distant future (which they are clearly excited about given the “yippee”). 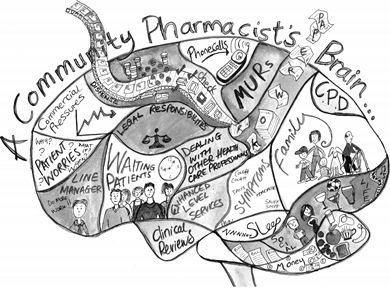 However there are lots of pressures and stressors that many pharmacists may relate to on this pharmacist’s brain too. Firstly a common theme – targets – for example the very back section (right where your occipital lobe would be) says 50 items an hour. 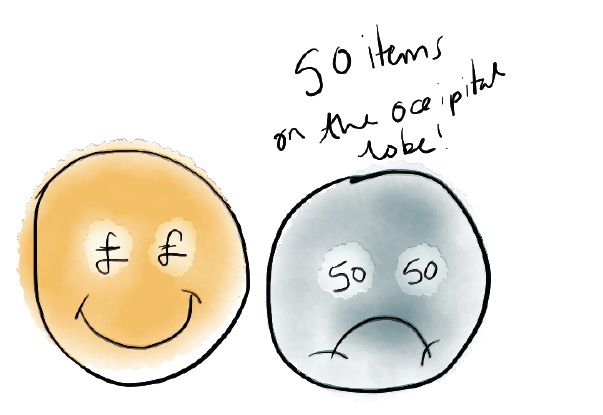 Because this pharmacist has put the 50 right at the back in their occipital lobes I’ve got this funny image in my head of a pharmacist with “50” imprinted on their eyes. Much like in cartoons when you see pound signs or dollars on their eyes! I’m not sure if I’m explaining the image in my head very well so I’ve doodled an explanation below! So these 50 items / hour I am not sure if this is a target set by the pharmacies that this pharmacist works with or whether this is the volume of work that is coming in to the pharmacies they are working in. Even so, 50 items an hour seems like a lot though given that each item may take a few minutes to check and dispense fully. Another target on this pharmacist’s brain is 2 MURs and NMSs a day which again we have seen several times on our blank brain images. There are some sections in this pharmacist’s brain that contain things I wasn’t expecting, for example shoplifters. I am sure that many community pharmacists have had encounters with shoplifters during their career and that this is a very big stress or pressure for community pharmacy staff from time to time (I hope not all the time). This pharmacist’s concern about laxative use / abuse is another worry which I am sure a lot of pharmacist’s have when they are selling OTC medicines like laxatives. To me, this is why pharmacists are so important, to be there to intervene when necessary and/or possible when people are buying these types of medicines to potentially cause harm to themselves. Yet knowing when and how to intervene when you have never met this person before must be incredibly difficult and I am not surprised it continues to be a concern and perhaps a pressure on this pharmacist’s brain even though they have been working as a pharmacist for some time. One final section that particularly sparked my interest was that this pharmacist wants some music to relax them and their colleague’s at work. From a mental workload perspective having music playing in the dispensary may not necessarily be a good thing. For starters it would have to be the type of music everyone enjoys (notoriously difficult to find) otherwise it would only be relaxing for some. Secondly, in the workplace where safety critical tasks are being carried out (like dispensing) we don’t necessarily want pharmacists and their colleagues to be too relaxed – you have to be alert and engaged enough to pick problems up as they arise, however we also don’t want you to be too stressed either – it is a very fine balance. Also, if everyone in the pharmacy is doing a different task, the music may help provide the right environment for some tasks, but not others. It is a complicated issue, often overcome in other work settings e.g. in an office situation one can wear headphones and choose to listen to what they want, when they want. I often listen to music or the radio on my headphones when I am entering lots of data, but not when I am writing simply because my mind zones out from the music when I am writing because I am concentrating. I guess headphones for a pharmacist who wants to listen to music are not so appropriate if they work in an open plan pharmacy! We’ve had another entry – and I have to admit that I received this a little while ago, but it arrived around the time that I was experiencing PhD student mental overload and I was trying to do too many things at once and it got lost under the piles of papers and books on my desk. However, here it is just in time for our final prize draw in 2 days time!! This pharmacist works for a multiple pharmacy and says that this is their brain at work, and at home. 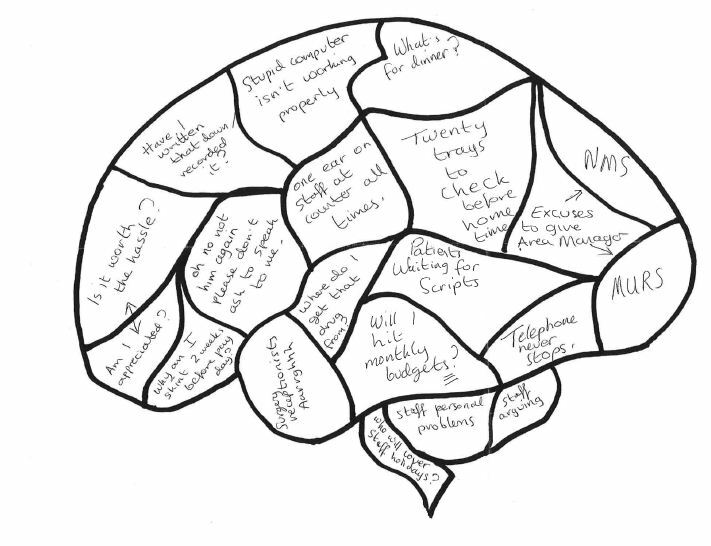 This pharmacist wrote to me when they sent in this blank brain to tell me a little about how they work hard at work to manage day to day stressors they use strategies both at work, and at home (e.g. Sahaja yoga) to help them cope with the ups and downs of everyday pharmacy life. I thought this was an interesting point as quite often the things that help me manage my stress levels at uni (and admittedly they are often not that great) are things that I can do at home, or in my spare time e.g. I like to run and I find that lifts my mood / reduces my stress greatly. But sometimes I do become so focussed on my work I forget to go and then I notice my stress levels increasing. Like most of the blank brains we’ve had in this pharmacist talks about targets, but also notes that they feel the targets are set up for failure which I am sure many pharmacists and other healthcare professionals relate to. Perhaps my favourite comment on this blank brain is towards the bottom where they mention the telephone a.k.a the “terror phone.” I have a love hate relationship with telephones and so can 100% relate to this analogy, even as I write this I can feel my anxiety rising at the thought of having to make cold calls. Annoyingly cold calls are a big part of research recruitment as postal and internet invitations on their own are not sufficient if we want to meet our recruitment targets, so I have had to make many cold calls throughout this project. The only way I got through it was to set myself targets (! ), and a list of pharmacies to tick off as and when I got a response, which made me sit down and make the calls. I also noted in the same section, the customer surveys which hasn’t come up before on the other blank brains. However, this has been something that I have heard a lot about, not through my work with community pharmacists in practice, but through the students that have also been taking part in my research and I think this is probably because it is something they weren’t expecting to have to carry out when they were going to do their placements in community pharmacies and maybe once in practice this is more of an accepted norm. This blank brain doesn’t indicate whether these surveys are a pressure, or something this pharmacist finds useful or interesting for their practice. What do you think, are they a good or useful tool? I think this is the last entry we can expect for this competition, so on Thursday I will announce our final winner who will receive a £50 amazon voucher! Good luck to all our entrants and thank you so much for sending these wonderful blank brains in.